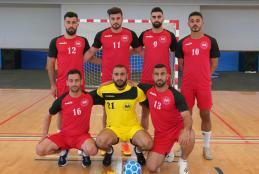 The head of the competitions committee in the Palestinian Federation of Palestinian Universities Hassan Nasif said that the championship started with a match between Al-Najah University and Palestine Technical Khadouri University, where Al-Najah won the game with a score of "2-1", the second game was between Palestine Technical Khadouri University and Arab American University, where AAUP won with a score of "10 - 2 ", and the third was between Arab American university and Al-Najah, where the game end with equal scores. 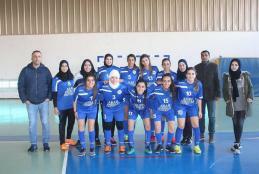 The Arab American University Girls team won Al-Khamsiat championship for football organized by the Palestinian Sports Union of Universities at Birzeit University, with the participation of five universities: Arab American University, Al-Khadouri Tulkarem, Birzeit, Bethlehem and Jerusalem University- Abu Dis. The championship was held on half-league system, with Jawad Assi, Nasser Dahbour and Sameh Al-Khawaja. The game started with Arab American team and Khadouri teams, which ended in the favor AAUP 9-0, Birzeit team won over Bethlehem with 2-0, Bethlehem won over Jerusalem -Abu Dis 1-0, Arab-American won over Birzeit 1-0, Birzeit team won over Khadouri team with 5-0, Arab American won over Jerusalem 1-0, and Arab-American won over Bethlehem 3-0. 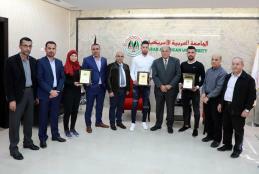 The President of Arab American University, Prof. Dr. Ali Zeidan Abu Zuhri, honored the students from the Faculty of Sport Science whom represented the Palestinian national football team in a number of international, continental and regional championships.